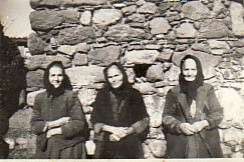 Above: Her mother, Maria, with her mother, Ralia, and unknown. Above Right: Skalohori. 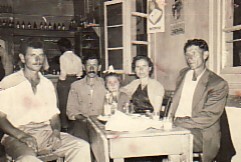 With her husband, Panagiotis, and their daughter, Chrysonthemi, and Ioannis Karagiannis (left) and Dimitrios (right). 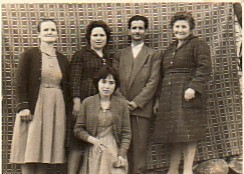 Above: Her daughter, Maria (seated front) with (from left): her sister-in-law, Elisavia; her niece, Dorothea and her husband, Stylianos; and her friend, Mando. 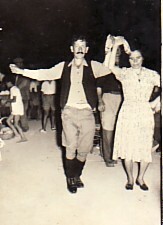 Above Right: Dancing with her husband, Panagiotis, at a panygiri.